Who hasn't over indulged in a meal at one time or another? We're all guilty of eating more than we should whether it's from celebrating our teams Super Bowl victory by having a few extra buffalo wings & potato skins or hastily eating that slice of pizza as you race off to your next client. Heartburn is a familiar foe to roughly 50% of Americans. 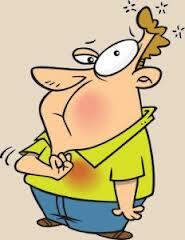 The most common sign of heartburn is a painful sensation in the throat, stomach or chest. Other symptoms can include, belching, a persistent sore throat or a sour taste in your mouth. So many people have experienced heartburn that it has come to be accepted that this is just a normal discomfort one must pay in order to enjoy certain foods. Sadly, the overwhelming thought is "this is just how my body works." But, just because something is COMMON, does not mean it is NORMAL. 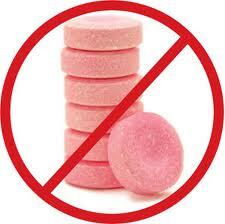 Acid indigestion is probably the most misdiagnosed & understood condition in health care. To help you understand a bit more, I'd like to walk you through a mini physiology course. 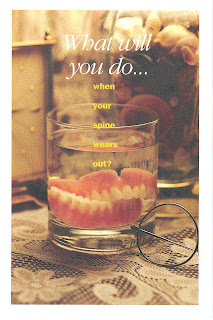 Digestion begins first in your mouth. The process of chewing your food is meant to break it down into small pieces so that you're able to access the nutrients needed to fuel your body. Once you swallow & food reaches your stomach, via the esophagus, your stomach stores the food & mixes it with digestive juices & enzymes in an effort to break the food down into even smaller parts. Stomach acid has to be strong stuff since it is meant to burn through flesh. After all that's what a double cheeseburger is....animal flesh. In order to effectively break down your food, the PH of your stomach needs to be in the range of 2-3 (highly acidic). This is basic physiology. Now imagine that you are engaging in the 2nd scenario (racing to see a client) I created above & you begin to experience heartburn. Conventional wisdom tell us that stress & indigestion go hand in hand; too much stress causes our stomachs to produce more stomach acid which leads to heartburn & ulcers. Yet, ANY physiology textbook will tell you that when the body is in a stress handling situation your Sympathetic Nervous System (fight or flight) is fully engaged. What does this mean exactly? Well, when you're eating that pizza in your car on your way to see a client & you get stuck in a massive pileup on Rte. 3 North. You glance at the clock & realize there is no way you're going to make this meeting & you begin to feel anxious & angry. At this point, if not earlier in the day, your sympathetic nervous system becomes activated. When in this stress handling situation, the body will divert ALL available energy AWAY from the GI tract. Think about it...if you were being chased by a bear in the woods, does it really make any sense for your body to increase the digestion of your lunch or does it make more sense for it to put all it's energy into getting your legs to move fast & escape? When you eat food in a stress handling situation, the food sits in your stomach & it waits. What is it waiting for you ask? Well, it's waiting for the Parasympathetic Nervous system to become engaged. It's responsible for Rest & Digest. So, if stress isn't causing this heartburn/indigestion what is? In most cases, it's a LACK of stomach acid..............................yes, I said a LACK of stomach acid. Without enough acid, your food sits in your stomach & rots. The stomach is a nice warm, moist place & what happens to food when it's in that environment? Yup...it rots. With rotting comes the organic gases & acids of fermentation & putrefaction which is not supposed to happen in your stomach. THIS leads to burning of the stomach & lower esophagus & hence, heartburn. Next month, I will delve into how acid blockers seriously hinder your health & how you can maximize your own stomach acid & get rid of heartburn. For every hour you sit in front of the TV you raise the risk of death by 11%. Sitting for more that six hours per day puts you on an early death list EVEN IF YOU EXERCISE. People who sit are more prone to high blood pressure, depression, and cancer. Sitting for longer periods of time predisposes you to developing diabetes and if you are already diabetic, then stick a fork in yourself because your done. What seems so non-threatening or non-toxic to our body is basically just the opposite. We are heading for a society just like in the movie "Wall-E" where all the humans sit around reclining in chairs, eat fast food and drink sodas, LOL. First, from a musculoskeletal point of view, let me try and describe to you why sitting could be a major contributor of your aches and pains most commonly your neck, shoulders, and lower back. First of all, anything done repetitively and for an extended period of time is going to cause some over-use issues leading to breakdown and injury. 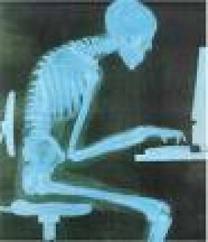 Sitting is NOT exempt from the overuse category even though you may not feel as though you're doing anything harmful. The reality is that your body is always fighting gravity and the way your structure is aligned is going to forecast how long it will be able to handle those gravitational forces before it starts to breaking down. Our office focuses on the Structural Correction of the spine. If the body has structural problems, muscles, tendons, ligaments, and discs are over stressed from the forces of gravity. Better ergonomics are not always enough. I look at ergonomics as a tool to help an already normal structure become more productive and withstand fatigue as a protective measure NOT a corrective measure. For example, a person with a herniated disc in their lower back might feel better with a seat cushion, but the herniation is still there and needs to be corrected. Applying better ergonomics to a broken structure is like putting tape on a baseball bat.....its temporary. Once a patient's structural problems are identified, a thorough game plan to correct and protect the structure is recommended for a long term solution. The other dangerous part to sitting is the LACK of MOVEMENT. No matter how good your structure and ergonomics, you are still not moving! Our bodies are meant to move; joints need to go through full ranges of motion to stay healthy. Soft tissue (muscle & ligaments) will adapt to any position after about 20 minutes and become abnormally shortened or lengthened. On top of that muscles and fascia are designed to slide on top of one another. Lack of movement causes a gluing of these structures to one another that prevents normal function. When a cat wakes up from a nap, the first thing it does is stretch to become more mobile. This is what most people don't do after being immobile for long periods. This lack of mobility causes the body to compensate (Structural Shifts) and move abnormally leading to secondary symptoms like pain. So what can you do? First, get a thorough structural assessment to identify any abnormal shifts in your spine. Second, get your work station assessed to see if it can be ergonomically improved. Third, move, move & move. See if you can do some work while standing and trade off. There are even treadmill desks that are becoming more popular. Fourth, perform some mobility exercises (especially for the lower body) to address the soft tissue affect of sitting. Fifth, if you have any questions, give us a call. A consultation is always no charge. It's a conversation, not a commitment. I know what you're thinking when you read the title of this post..."Seriously Dr. Terri. How can I lose weight by cleaning my house?" Metaphorically speaking, the house I am referring to is your body. It is the house that actually counts, because it is where you have to live each & every day of your life until you die. Cleaning your house has profound effects on your health; one of which is weight loss. Let's talk about cleaning house first. Our bodies naturally go through regular cycles of cleansing/detoxifying without our even being aware that it's happening. The primary systems involved include our liver, skin, lymphatics, digestive, urinary & respiratory systems. These all work together to neutralize & eliminate waste & potentially harmful substances that have entered the body. Sadly, each & every one of us now carries a toxic load/burden due to the overwhelming number of chemical substances in the environment, in our food, in our homes, in our water; in our lives. 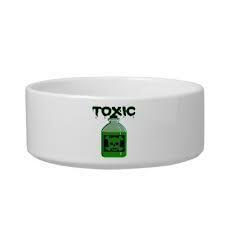 The body stores what it cannot get rid of & hence we all become a bowl of dirty toxic soup. So, how do I know if I should detox? Each & every one of us should detox at least once a year, but if you look at the list of symptoms below & you answer yes to any of them you should start 2013 off right by cleaning house. I have worked with a number of patients on detoxing their bodies & each & every one of them has experienced a life transformation. Whether it was a 25lb weight loss, the complete disappearance of diverticulitis or the overall improvement in mental clarity & energy, cleaning your house has amazing benefits. Let me walk you through the steps of a healthier & more amazing you in 2013.